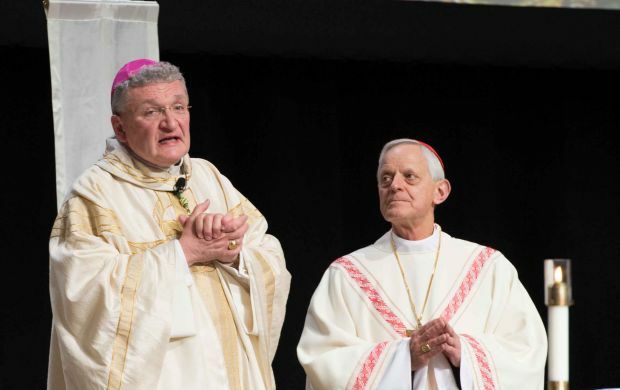 The April 22-24 convention and expo at the David L. Lawrence Convention Center was expected to draw more than 6,000 participants, including teachers, administrators, catechists, priests and professors. Speaking on the new evangelization in the opening day’s keynote, the cardinal highlighted the importance of the Catholic Church’s educational ministry and the need for church leaders and educators to working together to ensure Catholic education will help future generations learn about the Gospel and encounter Jesuit Christ. “In our structured, organized religious education efforts, Christ’s voice is heard today and his Gospel announced,” he said. In welcoming Cardinal Wuerl, the attendees were welcoming a local boy home. A Pittsburgh native, he was bishop of Pittsburgh for 18 years before being named to head the Washington Archdiocese in 2006. He became a cardinal in November 2010. Before officially opening the Exhibit Hall, NCEA’s executive vice president, Patrick Lofton, invited attendees to connect with NCEA and one another by engaging on Twitter and Facebook.